In the context of Champions of Kamigawa, Through the Breach was merely “cute”. You could get a death trigger from one of its legendary dragons basically at will; in larger card pools it was an interesting way to trigger one of Invasion‘s dragons damage effects, presuming you had enough mana, and it took a lot of the drawback away from creatures like Devouring Strossus. But a decade and a half of new creatures and the attendant expansion of things they do when they come into play or leave play does a lot, and there are few ways to cast it that don’t just win the game outright any more. I suppose you could just put a one-mana creature into play, but even then it dodges cards like Remove Soul. And notice that the new art shows Nahiri summoning Emrakul – that’s always an option, albeit one that probably triggers some kind of mutually assured destruction pact in some groups. Through the Breach is effectively an instant-speed Sneak Attack, and Sneak Attack is one of the integral cards in the Legacy deck “Sneak and Show”. And, lo and behold, Through the Breach shows up there. Because the only thing better than cheating something in is cheating it in and giving it haste, and while Through the Breach is usually only one shot of it, it’s still instant-speed, a valuable upside, and it even costs the same amount of mana as using Sneak Attack once. In Modern, while Goryo’s Vengeance is the preferred “cheat large creature in and give it haste” spell of choice (because it’s a lot cheaper), Through the Breach still has some upsides. You don’t need to set up the play in your graveyard, meaning that the strategy doesn’t completely fold to graveyard hate, and it also is easier to use with the original Eldrazi titans or the Darksteel/Blightsteel Colossus type of creatures. It makes for a good back-up plan in the Grishoalbrand deck, if nothing else. One last thing to note is that Through the Breach has the Splice onto Arcane mechanic. For the most part, because Through the Breach already is pricey and this isn’t a huge discount, it’s not likely to matter that much. That said, the Shoals (particularly Nourishing Shoal) are Arcane, and the Shoals can be cost without spending mana. 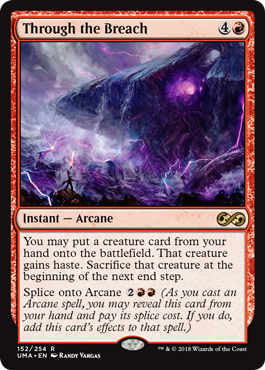 This gives Through the Breach an extra angle, because using Splice onto Arcane leaves it in your hand to cast anew in a subsequent turn. Through the Breach is a cool card used to enable mild degeneracy. Sounds about right.